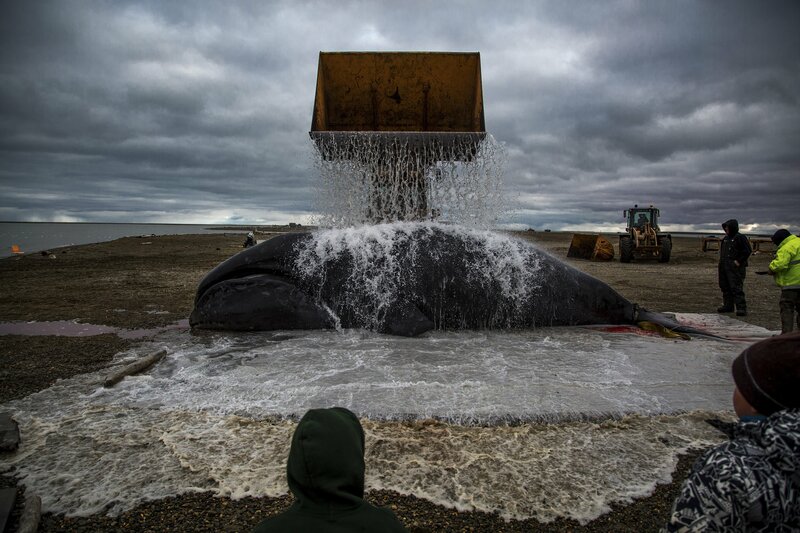 Scientists have counted up to 80 at a time in or near Kaktovik; many look healthy and plump, especially in early fall, when their presence overlaps with the Inupiat village’s whaling season. Much of 2016 was warmer than normal, and the freeze-up came late. In November, the extent of Arctic sea ice was lower than ever recorded for that month. Though the average rate of ice growth was faster than normal for the month, over five days in mid-November the ice cover lost more than 19,000 square miles, a decline that the National Snow and Ice Data Center in Colorado called “almost unprecedented” for that time of year. In the southern Beaufort Sea, where Kaktovik’s 260 residents occupy 1 square mile on the northeast corner of Barter Island, sea ice loss has been especially precipitous. The largest of the bear subspecies and a powerful apex predator, the charismatic polar bear became the poster animal for climate change. Al Gore’s 2006 film, “An Inconvenient Truth,” which depicted a lone polar bear struggling in a virtually iceless Arctic sea, tied the bears to climate change in many people’s minds. And the U.S. government’s 2008 decision to list polar bears as threatened under the Endangered Species Act — a designation based in part on the future danger posed by a loss of sea ice — cemented the link. 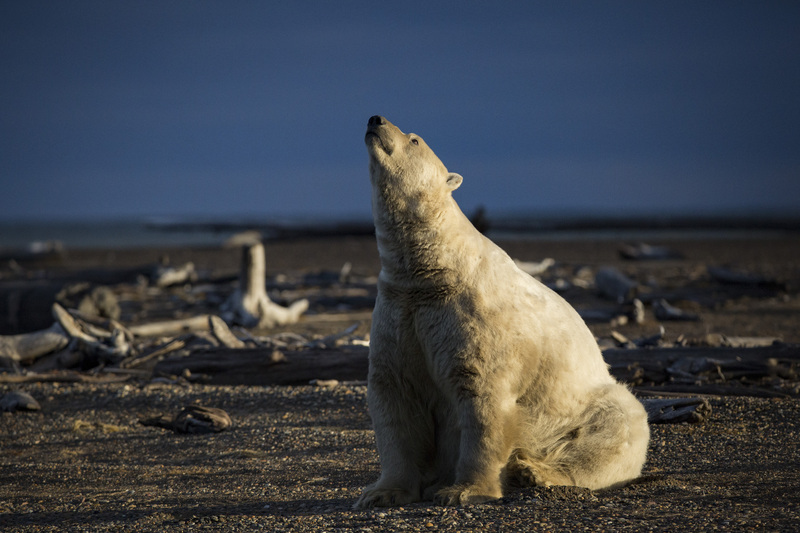 But even as the polar bear’s symbolic role has raised awareness, some scientists say it has also oversimplified the bears’ plight and unwittingly opened the door to attacks by climate denialists. Few scientists dispute that in the long run — barring definitive action by countries to curb global greenhouse gas emissions — polar bears are in trouble, and experts have predicted that the number will decrease with continued sea ice loss. A 2015 assessment for the International Union for Conservation of Nature’s Red List projected a reduction of more than 30 percent in the number of polar bears by 2050, while noting that there was uncertainty about how extensive or rapid the decline of the bears — or the ice — would be. A version of the assessment was published online Dec. 7 in the journal Biology Letters. But the effect of climate change in the shorter term is less clear cut, and a populationwide decline is not yet apparent. Nineteen subpopulations of polar bears inhabit five countries that ring the Arctic Circle — Canada, the United States, Norway, Greenland and Russia. 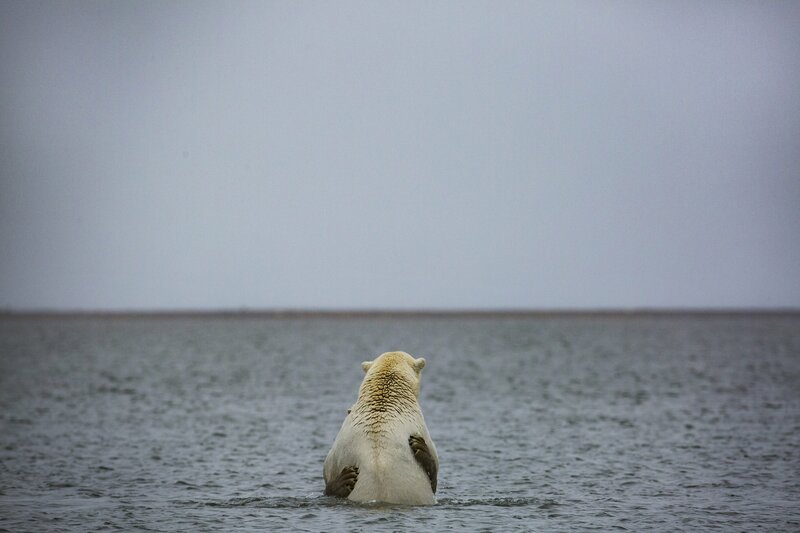 Of those, three populations, including the polar bears in the southern Beaufort Sea, are falling in number. In their analysis, the researchers who conducted the Red List assessment concluded that polar bears should remain listed as “vulnerable,” rather than be moved up to a more endangered category. Yet numbers aside, scientists are seeing other, more subtle indicators that the species is at increasing risk, including changes in the bears’ physical condition, body size, reproduction and survival rates. And scientists have linked some of these changes to a loss of sea ice and an increase in ice-free days in the areas where the bears live. Climate-change denialists have seized on the uncertainties in the science to argue that polar bears are doing fine and that sea ice loss does not pose a threat to their survival. But wildlife biologists say there is little question that the trend, for both sea ice and polar bears, is downward. The decline of a species, they note, is never a steady march to extinction. 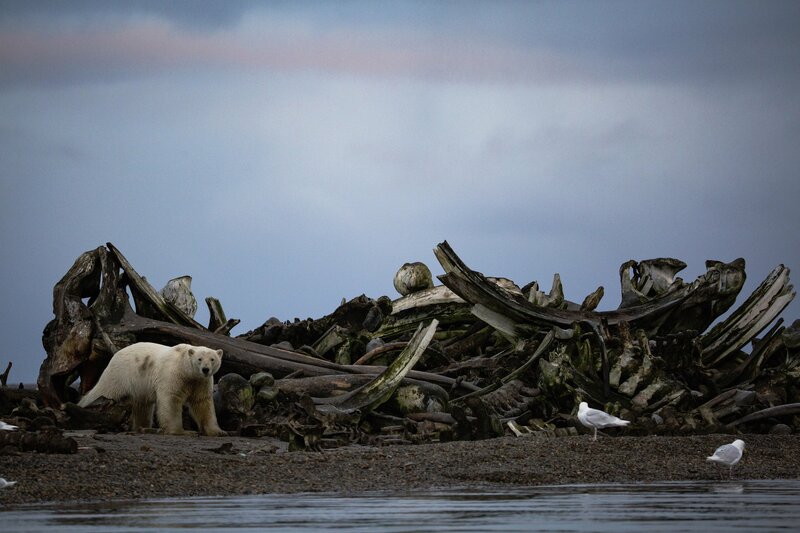 “It’s not going to happen in a smooth, linear way,” said Eric Regehr, a biologist at the federal Fish and Wildlife Service in Anchorage who took part in the 2015 assessment and presented the findings at a meeting in June of the International Union’s Polar Bear Specialist Group. A dozen polar bears pick through the bone pile that sits just outside town. Men from the whaling crews had dumped the carcass of a bowhead whale on the pile earlier in the day. As two visitors watch from the safety of a pickup truck a few hundred yards away, the bears devour the leftover meat and blubber. The Inupiat, who have been whaling in Kaktovik for thousands of years, believe that a whale gives itself to the crew that captures it. Once the animal’s body is pulled to shore, water is poured over it to free its spirit. But as the climate has warmed, the spring thaw has come earlier and the fall freeze later. The pack ice that was once visible from Kaktovik even in summertime has retreated hundreds of miles offshore, well beyond the southern Beaufort’s narrow continental shelf. The edge of the pack ice is now over deep water, where seals are few and far between and the distance to land is a long swim, even for a polar bear. As a result, researchers have found, a larger proportion of the bears in the southern Beaufort region are choosing to spend time on shore: an average of 20 percent compared with 6 percent two decades earlier, according to a recently published study by Atwood of the Geological Survey and his colleagues that tracked female bears with radio collars. And the bears are staying on land longer — this year they arrived in August and stayed into November — remaining an average of 56 days compared with an average of 20 days two decades ago. 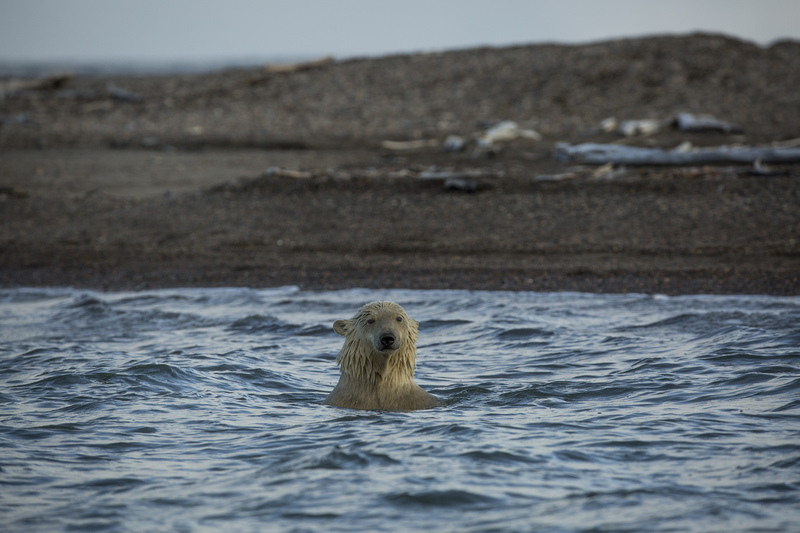 The shifts that researchers are seeing go beyond where polar bears decide to spend their summers. 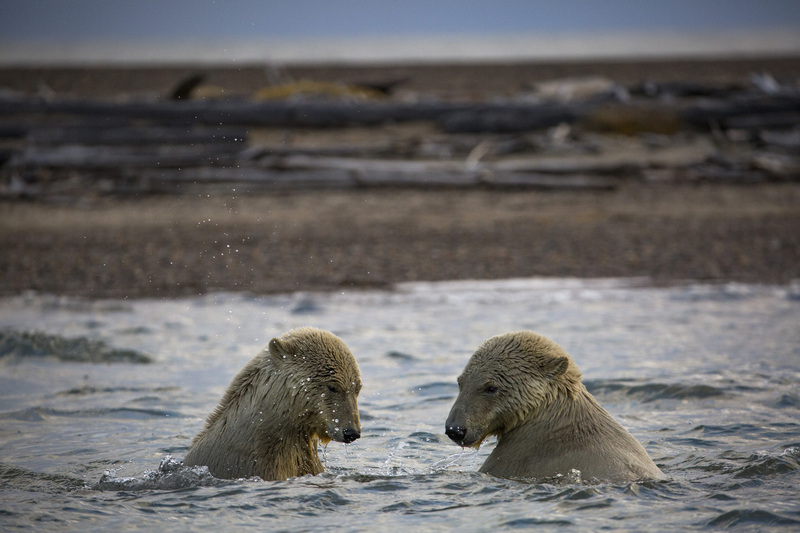 In the southern Beaufort Sea and in the western Hudson Bay — the two subpopulations studied the most by researchers — bears are going into the winter skinnier and in poorer condition. They are also smaller. And older and younger bears are less likely to survive than in the past. About 1,200 people came to view the bears in 2015, and the number is increasing year by year, according to Robert Thompson, an Inupiat guide who owns one of six boats that take tourists to view the bears. 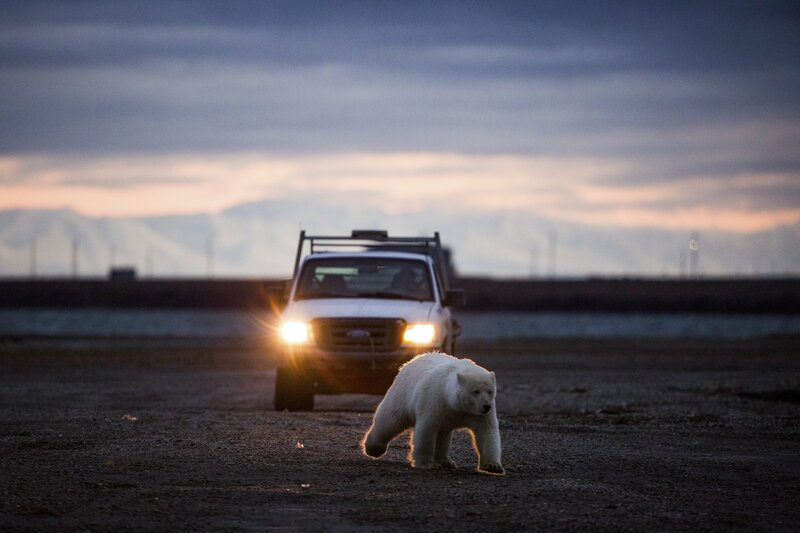 Susan Trucano, who arrived in early September with her son, Matthew, said they wanted to see polar bears in the wild before they were driven to extinction. The increasing tourism has been a financial boon for some people in Kaktovik, but it has upset others. Tourists take up seats on the small commercial flights in and out of the village during the fall months when the bears are there, crowding out residents who need to fly to Anchorage or Fairbanks. And some visitors wander through town snapping pictures without asking permission, or get in the way of the rituals that accompany the whale hunt. Last year, an intrusive tourist nearly came to blows with one of the whaling captains. For the most part, polar bears and people have coexisted peacefully. Village residents are tolerant of the bears — “They could break right in here, but they know the rules,” said Merlyn Traynor, a proprietor of the Waldo Arms Hotel — and with the whale remains, they have little reason to come after humans. But as the Arctic ice continues to shrink, bears are arriving in poorer condition and are staying longer, even as the number of tourists increases. 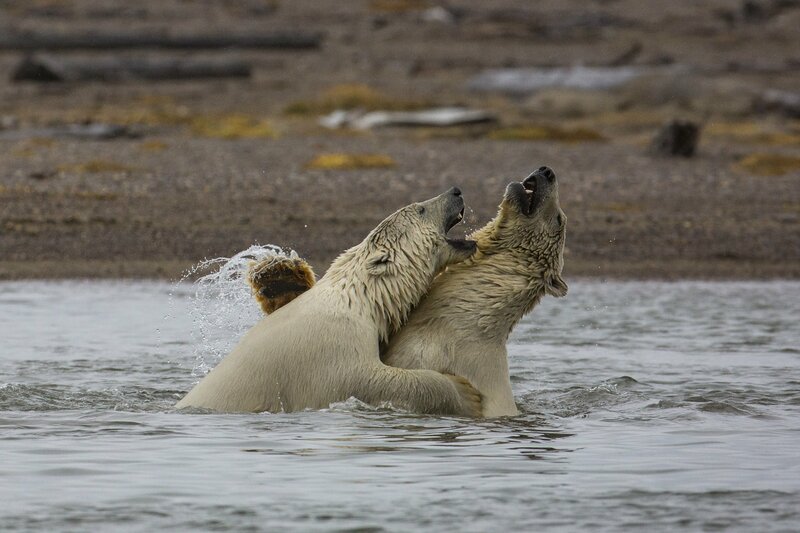 Interaction between bears and humans is becoming more common, as it has in other parts of the Arctic, exposing the polar bears to more stress and the people to more danger. There have been no attacks on humans, but there have been some close calls. Polar bear experts say they worry that at some point the number of bears seeking food here will exceed what is available. Threatened species like lions or wolves face predictable threats: poaching and hunting, or the encroachment of human settlements on their habitat. Sport hunting once posed a significant danger to polar bears, greatly shrinking their numbers in some areas until 1973, when an agreement among the Arctic countries restricted hunting to members of indigenous groups, and the populations began to rebound. Oil spills, pollution and over-hunting still pose some risk. But these dangers pale compared with the loss of sea ice. For many researchers, the most pressing question is how many days a polar bear can survive on land without the steady source of high-fat nutrition seals usually provide. 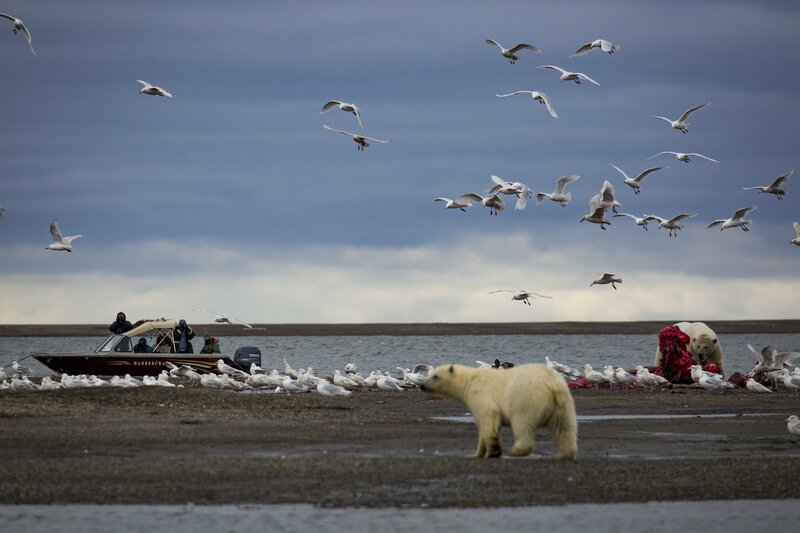 Some scientists have suggested that the bears might learn to survive on other types of food — snow geese, for example — or that they might learn to catch seals in the water, without relying on the ice as a platform. Such changes usually evolve over thousands of years, said David Douglas, a research wildlife biologist at the Geological Survey, who spoke at the specialists group meeting. 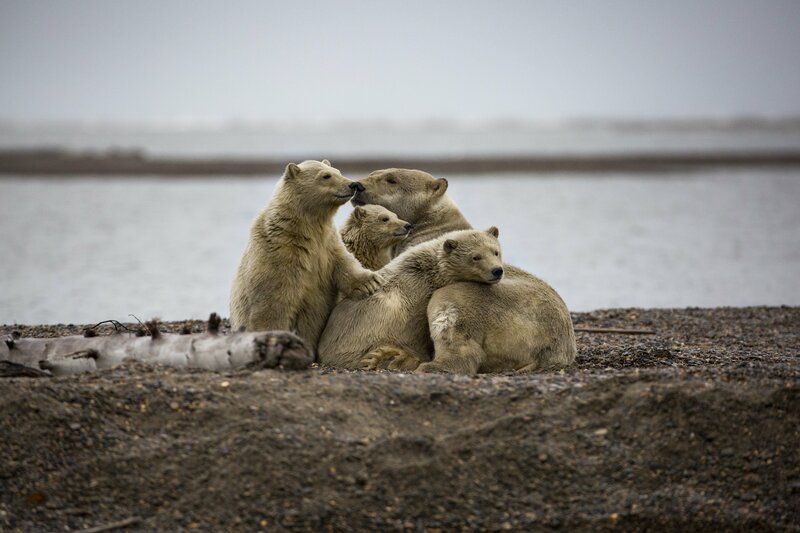 But the loss of sea ice “is taking place over potentially a very rapid time frame, where there may not be a lot of time in polar bear generations to home in on behaviors that could give some advantage,” he said. Much depends on how much of the ice disappears. Under some climate models, if steps are taken to control greenhouse gas emissions, the species could recover. And some evidence suggests that during an earlier warming period polar bears took refuge in an archipelago in the Canadian Arctic. In Kaktovik, at least for now, whales are providing the bears with an alternative source of food. But dead whale is not a polar bear’s preferred cuisine.